QGR gets a lot of interesting questions and comments, and we value all of them. 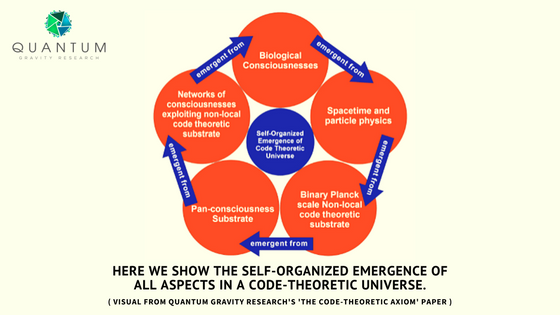 A recent question pertains to QGR’s emergence theory and whether it accounts for multiverse theory and the delayed choice quantum eraser, and what about the E8 Crystal in all this? The answer partly can be found in our new paper The Code-Theoretic Axiom. (1) Copenhagen interpretation related ideas, which says that a possibility space that is not real exists and when particles can exist either as a non-physical probability wave or, after being measured, can exist as a particle, i.e., wave particle duality and the notion of superposition. (3) many-worlds type ideas that also deny wave particle duality and say that there is a physically real set of universes and that we, or a single particle, branch through a network from moment to moment of these many universes. Our approach has similarity to all three. The similarity to the Copenhagen interpretation is that we agree measurement is deeply key to what is real and what is not. Our similarity to the pilot wave QM interpretation is that we think a particle has a wave aspect and a particle aspect at the same time. The wave aspect is what we call an “empire wave”, from the object in quasicrystal math called the “empire” of a vertex in the quasicrystal. And our approach is similar to the many worlds approach insofar as having a large but finite set of paths through a non-physically real possibility of paths that exists. A key difference is that choice or measurement, according to the Code Theoretic Axiom paper of ours, navigates the syntactically legal choices through the possibility space, where the choice pathways are physically real. Projecting a slice of the E8 crystal to lower dimension via an irrational angle gives us the geometric possibility space as well as the code syntax that can operate on it. As far as the quantum eraser experiment, it will be difficult to clarify this connection in a brief note like this. However, I can say that the delayed choice experiment indicates that an action associated with measurement knowledge in one part of spacetime can influence things in another part of spacetime. Our approach indicates this because (1) you can think of multiple legal states of our 3D quasicrystal living in a 4D quasicrystal possibility space. And (2) you can learn about interacting phason empire waves in the 4D quasicrystal to be in feedback loops, according to empire interactions, with phason quasiparticles in the other parts of the space-time quasicrystal.